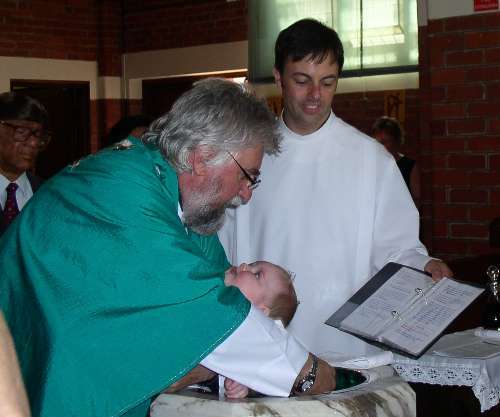 The Anglican Parish of Christ Church Essendon welcomes enquiries about baptism and confirmation. Many people grow up in the Church because they have been baptised as babies and brought up in a Christian family. That is not always the case. Increasing numbers of older people – from teenagers to great grandparents – are making their own decision to join the Church. For some people this comes as a sudden conversion. For others, a curiosity about God or about the person of Jesus grows into a gradual awareness of his presence and an increasing conviction that he demands some sort of personal commitment. They feel the need to express that commitment by joining a worshipping community of the Church. Some people follow a slightly different path. They get involved with their friends or their children in the social activities of their local church without having much interest in what the Church is really for. They enjoy the friendship of Christian people and get interested in the Church for its own sake. Gradually, they, too, want to belong. If you find yourself in this position, what should you do? Talk to your Christian friends or to Christians you know and trust. Go to church – with a friend if possible – and choose the main Sunday service. In our Parish the congregation gathers for a cup of tea or coffee afterwards and newcomers are welcomed. This is a chance to meet other members of the congregation and to introduce yourself informally to the clergy. Many people were baptised (christened) as a baby but have had little contact with the Church since. Baptism is, nevertheless, permanent and cannot be cancelled or repeated. So, if you were baptised as a baby, in whatever church that took place, you are still baptised and you cannot be baptised again. Some people do not know whether they have been baptised or not. It is important to find out from parents or older relatives and to discover where it took place, because you may need to obtain a baptismal certificate. Talk to the Parish Priest for more information. If you are a Christian from another denomination and feel drawn towards joining the Anglican Church, the way this is done will depend partly on your present denomination. If you have been baptised in another denomination, then, after a period of preparation, you will be received into the Anglican Church, probably by a bishop during a confirmation service. If you have not been confirmed, or even baptised, then you will be prepared for this along with other candidates. Talk to the Parish Priest for more information. If you have not been baptised, that is the place to start. In the early days of the Church, new Christians were often baptised at Easter. After a course of instruction in the faith, they publicly entered into a new life. They repented of their sins, were assured of God’s forgiveness and were baptised, often in a river. This was a symbol that they had died to their old life and, born again, been given a share in the Holy Spirit who came on Jesus at his baptism and, after his resurrection, was given to his disciples. Generally, in the early Christian centuries, those who joined the Church were not only baptised with water: the bishop also laid his hands on them in blessing, a rite which later developed into what we know as confirmation. Admission to the Church was completed by their receiving Holy Communion for the first time. Baptism, confirmation and first communion still form the pattern today. If you begin to feel you want to be received into the Church, discuss it with the Parish Priest. He will probably suggest that you be prepared for baptism and confirmation at the same time and that you join a confirmation class. The baptism of adults is normally followed by confirmation and first communion.